Games Workshop is Dead! Long Live Games Workshop! On January 16th, Games Workshop announced that its profit dropped by Â£3.4 million compared to the same period last year. Once that arcane utterance hit the internet, the Eye of Terror opened. Fell things came forth to pick the company's corpse. Heretics spread rumors and uttered blasphemies about price hikes. Games Workshop's empire, the headlines said, was burning. Except that's not really true. Games Workshop is far from dead - though it will have to confront many structural problems in the grim darkness of the near future. Though it took a glancing hit, the venerable dreadnaught GW lumbers on. While it's true that a dip in profits is worrying, making a Â£7.7 million profit - rather than an Â£11.1 million one - isn't the same thing as running at a loss. A stock selloff precipitated by a poor earnings report isn't a good thing by any measure, but it's not the apocalypse. Games Workshop's stock price, even after the drop, is around Â£5.50 a share - that's Â£3.50 more than it was in 2009. Also note that this was only a half-year report, so while GW isn't expected to make its Â£22.5 million full-year forecast, they'll certainly make more than Â£7.7 million in 2013-2014. Its specialty miniature company Forge World and fiction imprint The Black Library are both doing fine. The company's financially solvent, with Â£9 million worth of cash in their bank account and zero debts. So while it's true GW's profits aren't as big as they've been in the past, let's not get dramatic - this is hardly a company that's burning to the waterline. That's not to say, however, that GW doesn't have challenges it needs to face down. There are many structural problems that the company will face in the years ahead, from pricing, to an aging customer base and even new manufacturing techniques. If I walked into a GW store today and bought a ten-man Space Marine squad, a Rhino and five Citadel Paints to gussie them up, I'd pay about $100 after tax. One. Hundred. US. Dollars. That's $40 for the marines, $37.25 for the Rhino, and $20 for five paint pots. One hundred dollars. For single troops choice and a dedicated transport. That's insane. Like Astropath-pulling-too-much-overtime insane. Citadel Miniatures have never been a cheap product, but during the ten years I played I watched the price per-mini skyrocket. In 2003 I remember paying $30 a box for 20 plastic Cadian Shock Troopers, now it's $29 for half as many models. Meanwhile, the points cost to field a basic trooper went down, meaning Imperial Guard players needed more of the models that had doubled in price. And that's not even mentioning the new hardcover army Codexes, which go for $50 a pop. What happened was this: Games Workshop decided that their miniatures, already expensive, should become a premium product. Around the time of the price hikes, GW informational literature to investors and independent retailers started referring to their product as "The Best Toy Soldiers In the World." 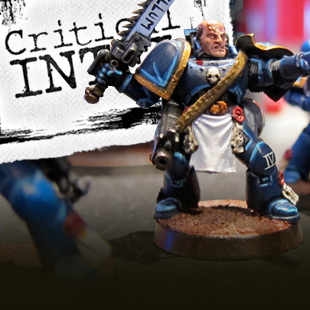 While they have a point - Citadel makes excellent miniatures - I feel that perspective convinced GW management that they could take on a premium-pricing model. Their market dominance meant that they had few competitors, and increasing profits could fund retail expansion, please shareholders and make up for the recession. Furthermore, price hikes (and occasional new units) were a way to increase profits from existing customers who only bought a few units a year. But here's the problem: Every time they used price hikes to squeeze existing customers who'd already bought into the game, they raised entry cost for new players. That makes it harder to recruit the 13 and 14 year-olds who're critical in sustaining the hobby the long term. After all, why would teens pay $500 to create an army when they can get their strategy fix from League of Legends? This is why Forge World - a luxury brand that targets older players with more money - is doing fine, while the core game suffers. And as the premium-pricing model weeds out the younger players, you run into a bigger problem from the other end.